A Charlie Brown Christmas is a 1965 studio album by American composer/conductor Vince Guaraldi (later credited to the jazz group the Vince Guaraldi Trio). The album was released in December 1965 in the United States by Fantasy Records. It is the soundtrack to the CBS Christmas television special of the same name. Guaraldi was contacted by television producer Lee Mendelson several years prior to compose music for a documentary on the comic strip Peanuts and its creator, Charles M. Schulz. Although the special went unaired, these selections were released in 1964 as Jazz Impressions of "A Boy Named Charlie Brown". Coca-Cola commissioned a Christmas special based on Peanuts in 1965 and Guaraldi returned to score the special. A Charlie Brown Christmas features several originals ("Christmas Time Is Here", "Linus and Lucy") as well as covers of contemporary Christmas songs ("The Christmas Song", "O Tannenbaum"). The score for the special was largely cut at recording sessions at Glendale, California's Whitney Studio. Much of this material was later re-recorded by Guaraldi at three sessions later in the year at Fantasy Recording Studios in San Francisco, alongside a choir of children culled from St. Paul's Episcopal Church in nearby San Rafael. The sessions ran late into the night, with the children rewarded with ice cream afterwards. Bassist Fred Marshall and drummer Jerry Granelli have been credited as performing on the album, although a host of musicians claim to have recorded the album. Released a week prior to the broadcast premiere of the special, A Charlie Brown Christmas sold well, and became increasingly famous in the ensuing decades. It is among the most popular Christmas albums in the United States, where it has been certified Triple Platinum, having shipped at least three million copies. As of November 2014, A Charlie Brown Christmas is the tenth best-selling Christmas/holiday album in the United States during the SoundScan era of music sales tracking (March 1991 – present), having sold 3,410,000 copies according to SoundScan. The Vince Guaraldi Trio's A Charlie Brown Christmas has been voted into the Grammy Hall of Fame and added to the Library of Congress's National Recording Registry list of "culturally, historically, or aesthetically important" sound recordings. By the early 1960s, Charles M. Schulz's comic strip Peanuts had become a sensation worldwide. Television producer Lee Mendelson acknowledged the strip's cultural impression and produced a documentary on the subject, titled A Boy Named Charlie Brown. Mendelson, a fan of jazz, heard a song by Vince Guaraldi on the radio not long after completion of his documentary, and contacted the musician to produce music for the special. Guaraldi composed the music for the project, creating an entire piece, "Linus and Lucy," to serve as the theme. Despite the popularity of the strip and acclaim from advertisers, networks were not interested in the special. The first instrumentals for the special were recorded by Guaraldi at Glendale, California's Whitney Studio with bassist Monty Budwig and drummer Colin Bailey. Recycling "Linus and Lucy" from the earlier special, Guaraldi completed two new originals for the special, "Skating", and "Christmas Time Is Here". In the weeks preceding the premiere, Mendelson encountered trouble finding a lyricist for Guaraldi's instrumental intro, and penned "Christmas Time is Here" in "about 15 minutes" on the backside of an envelope. The special opens and closes with a choir of children, culled from St. Paul's Episcopal Church in San Rafael, performing "Christmas Time Is Here" and "Hark! The Herald Angels Sing". One of the singers, Candace Hackett Shively, went on to become an elementary school teacher, and sent a letter of gratitude to Schulz after announcing his retirement in 2000. In the letter, she recalls recording the choir at Fantasy Studios and going out for ice cream afterwards, while also noting that she tells the story to her grade-schoolers each holiday season. The recording sessions were conducted in late autumn 1965, and were cut in three separate sessions over two weeks. They often ran late into the night, resulting in angry parents, some who forbid their children from returning; as such, numerous new children were present at each session. The children were directed by Barry Mineah, who demanded perfection from the choir. Mendelson and Guaraldi disagreed, desiring the "kids to sound like kids"; they used a slightly off-key version of "Hark! The Herald Angels Sing" in the final cut. Children were paid five dollars for their participation. In addition, the children recorded dialogue for the special's final scene, in which the crowd of kids shout "Merry Christmas, Charlie Brown!". The soundtrack for the special was recorded during these sessions, with decisions regarding timing and phrasing determined quickly. Guaraldi brought in bassist Fred Marshall and drummer Jerry Granelli to record the music, and spent time later re-recording earlier tracks, including covers of "The Christmas Song" and "Greensleeves". The eventual LP release credited Guaraldi solely, neglecting to mention the other musicians; Guaraldi was notorious for never keeping records of his session players. Nearly three decades later, in an effort to correct the matter, Fantasy surmised that the recordings with Budwig and Bailey were employed in the special, while Marshall and Granelli recorded the album. Despite this, other individuals have come forward claiming to have recorded the special's music: bassists Eugene Firth and Al Obidinksi, and drummers Paul Distel and Benny Barth. Firth and Distil are noted as performers on a studio-session report Guaraldi filed for the American Federation of Musicians. A Charlie Brown Christmas first appeared on a Billboard magazine music sales chart on the week of 19 December 1987, when it both debuted and peaked at No. 13 on Billboard's Christmas Albums sales chart. The album charted on Billboard's Christmas Albums chart each Christmas/holiday season from 1988 through 2003, peaking as high as No. 8 in both 2001 and 2002. The album also charted on Billboard's Top Pop Catalog Albums chart during the Christmas/holiday season each year from 1991 through 2003, peaking as high as No. 6 in 2001. In 2006, A Charlie Brown Christmas was certified three-times Platinum by the Recording Industry Association of America for shipment of three million copies in the United States. A Charlie Brown Christmas was also the tenth best-selling holiday album of 2011, a year that marked the sixth time since 2001 that the album had ranked among the year's top 10 Christmas albums. It was also the ninth best-selling album of 2013. As of November 2014, A Charlie Brown Christmas was the tenth best-selling Christmas/holiday album in the U.S. of the Nielsen SoundScan era of music sales tracking (March 1991 – present), having sold 3,410,000 copies during that period. Allmusic reviewer Shawn M. Haney called it "joyous and festive meditation for the holiday season," writing, "Guaraldi strings together elegant, enticing arrangements that reflect the spirit and mood of Schulz's work." Pitchfork Media's Dominique Leone called the album's songs "small, observant miracles," remarking, "If there's a muted quality to a lot of this music, it's smiling nonetheless." Library of Congress essay on original album. Bang, Derrick (2012). Vince Guaraldi at the Piano. McFarland. Mendelson, Lee (2013). A Charlie Brown Christmas: The Making of a Tradition. It Books. Solomon, Charles (2013). A Charlie Brown Christmas: The Making of a Tradition. Chronicle Books. ^ "The Gifts That Keep on Giving: Biggest Radio and Album Hits of the Holidays". ^ John Kiesewetter (December 11, 2000). A Charlie Brown Christmas' almost didn't get made"'". ^ a b c Whitburn, Joel (2004). Christmas in the Charts (1920–2004). Wisconsin: Record Research Inc. p. 149. ^ a b Grein, Paul (2012-01-04). "Week Ending Jan. 1, 2012. Albums: She’s Back". ^ Paul Grein (January 2, 2014). "The Top 10 Soundtracks of 2013". Chart Watch (Yahoo). ^ a b "The Gifts That Keep on Giving: Biggest Radio and Album Hits of the Holidays". ^ a b Shawn M. Haney. "A Charlie Brown Christmas - Allmusic review". ^ Dominique Leone (December 13, 2006). "A Charlie Brown Christmas Review". ^ a b c Chris Barton (December 19, 2013). 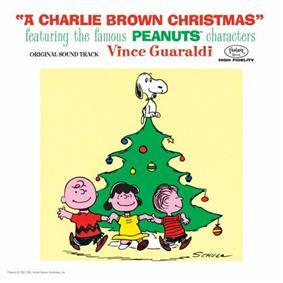 "Vince Guaraldi's 'A Charlie Brown Christmas' score is a gift". ^ Bang 2013, p. 190. ^ shurbuilders. CONCORD EXPLAINS": Amazon.com Customer Review — A Charlie Brown Christmas""". Amazon.com. Archived from the original on 10 December 2007. Retrieved 2007-11-10. ^ a b c d e f Chart History"A Charlie Brown Christmas". Children's chorus for the songs "Christmas Time Is Here", "Hark the Herald Angels Sing" and when the kids all shout "Merry Christmas Charlie Brown" were performed by members of the choir of St. Paul's Episcopal Church in San Rafael California. Several months before the making of Charlie Brown Christmas this choir was featured on the Vince Guaraldi recording Vince Guaraldi at Grace Cathedral. A free replacement disc (correcting the 2 errors) was offered to those who desired one, with a stated offer expiration of March 1, 2007. Also, the post promises that all new copies produced from that point forward would be of the correct version of the remastered CD. Track 1: "O Tannenbaum" – the original LP version had the introduction to the song cut off; the new CD has the intro reinstated. Track 5: "Christmas Time Is Here (instrumental)" – the original LP version fades out at the end of the song almost losing the last chord; the new CD intentionally retains the last chord. Track 7: "Skating" – the original LP version fades during the bass solo at the very end; the new CD intentionally allows the song run to its conclusion adding about ten seconds to the track. Regarding the perceived use of noise reduction: The new CD is remixed from the original three-track so the reason the old familiar hiss is not heard is not due to the use of noise reduction, but rather that the new mix is much quieter than the two-track stereo master. The only place noise reduction was utilized was on Track 10, "Für Elise", as there is no three-track for that master—it was originally recorded direct to two-track. Track 8: "Hark, The Herald Angels Sing"- In the movie, the part where the children are humming the song to the accompaniment of a Hammond organ is cut off by Charlie Brown saying, "What's going on here? ", and after they all say "MERRY CHRISTMAS, CHARLIE BROWN! ", they all commence singing the song. Also, the final six seconds were missing because of the original voice-over that used to say, "Brought to you by the people in your town who bottle Coca Cola." In the new Soundtrack, both the humming and the singing tracks are complete. Track 4: "Linus and Lucy" – the original LP version was an edit of two different takes. In the remix for the new CD, one of the takes was used in its entirety; a 25 second section of the previously unreleased part of the take (beginning at 1 minute 54 seconds) is heard in the TV animation at 17 minutes 11 seconds into the show. Track 9: "Christmas Is Coming" – the original LP version and the version on the new CD are entirely different takes. Concord Music Group, the parent company of both Concord Records and Fantasy Records, acknowledged negative criticism in a post on its website entitled "Oh, Good Grief! A Charlie Brown Christmas Conundrum". The article explains what listeners were hearing, and notes that mistakes had indeed been made in the remastered version. Haney wrote that the record "introduce[d] contemporary jazz to youngsters with grace, charm, and creativity."